If you ever needed proof that sushi can be a conversation starter, soy paper sushi wraps are surely it. Resemblant of miniature flower bouquets, soy paper sushi wraps can be filled with just about any ingredient imaginable, yet still look as though they’ve been crafted by a professional sushi chef! 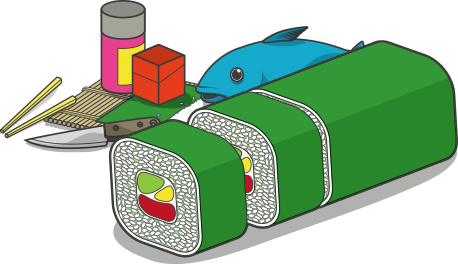 Predominantly made from compressed soy beans, sushi wrappers (known as “mamenori” in Japanese) are thin, flexible, and entirely edible; often used in place of Nori in fusion bars to create kawaii sushi rolls. Versatile and virtually calorie free, these colorful papers offer no end of creative freedom – including the ability to print your own images onto them, with the help of an edible ink cartridge. Sushi-making doesn’t get much cooler! Beloved by professionals and novices alike, Yama Moto Yama Sushi Party Soy Wrappers inspire no end of fun and creativity with their quirky colors. But, despite their vivid hues (Paprika Orange, Spinach Green, White, Sesame and Turmeric Yellow) Yama Moto Yama Sushi Party Wrappers are entirely free of artificial colors and flavors; dyed using natural food and plant extracts. They’re also made entirely from soy beans, so, they’re gluten free too! Comprising sixty individual sheets, the Yama Moto Yama Sushi Party pack is more than ample supply for creating floral bouquets and spring roll wraps for a small party or get-together. Go on, let your imagination run wild!